On October 6, 2016 the Head of the Department of Law, Sociology and Political Science Prof. Svitlana Schudlo and postgraduate course head Assoc. 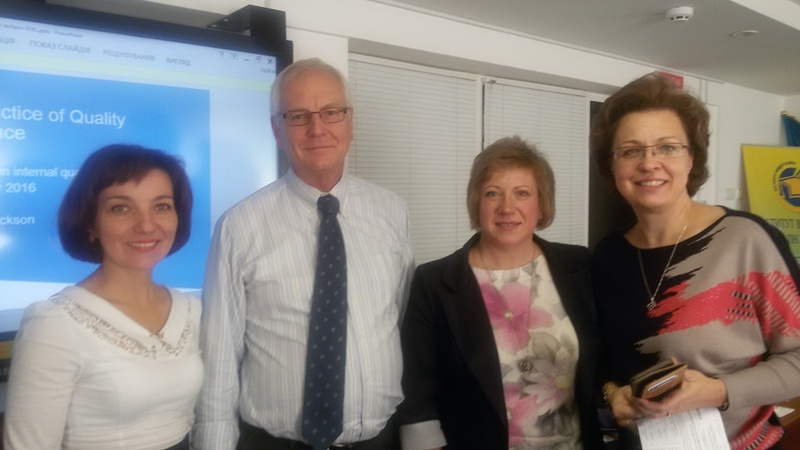 Prof. Tetiana Kozak attended the seminar of Stephen Jackson, a former director and now a consulting expert of the British Higher Education Quality Assurance Agency. The topic of the seminar was “The system of education quality assurance at the university level” and it was held at the Institute of Higher Education (NAPS of Ukraine, Kyiv), supported by the British Council. It focused on the experience of providing quality education in UK universities. On October 7, 2016 Prof. C. Schudlo together with representatives of 12 universities took part in the report on university project implementation monitoring, submitted to the British Council, the University Leadership Potential Development Program, held at the Institute of Higher Education (NAPS of Ukraine). The project of Ivan Franko Pedagogical University, Drohobych deals with problems of evaluating the quality of educational programs; it has been implemented since March 2016 by a team led by the University Rector Prof. Nadiya Skotna and consists of Prof. S. Schudlo Assoc. Prof. I. Hrynyk, Assoc. Prof. Yu. Skvarok, Assoc. Prof. T. Pantyuk, students L. Vovk, O. Maletych.